Heat activated Thermal Fitting Material is the secret to making Billy Bob teeth fit so comfortably and naturally. The Thermal Fitting Material includes one 3 oz. bag of molding pellets. 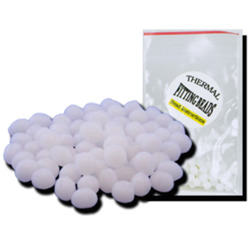 Begin by pouring some beads into a container of very hot water, and wait until the granules turn into a clear mass. Using a spoon, scoop some of the material out. When it is cool enough to handle, work a small amount into the "trough" of your fake teeth. Now, position the teeth in your mouth, using your fingers to tuck any excess material around your teeth and gums for a secure fit. Let the material set for just a few moments, then remove the teeth and allow them to cool completely. Not happy with the fit? You can re-heat and re-shape Thermal Fitting Material as many times as you like!